I’ve been subscribed to My Paper Pumpkin since it started and so each month, I tend to get excited about the newest projects and stamps that come in the mail each month, and I sometimes forget about the past stamps. But with the August promotion where you can get your first 2 months for only $10 a month (including shipping! ), I have had some new friends join Paper Pumpkin this month and get the welcome kit. So, I wanted to send a little note saying hello and thank you and decided to pull out those stamps that come with the welcome kit. It all started with a card base that I had made a while back by embossing the entire card front with the Honeycomb embossing folder. Then just started adding some fun elements that were lying around my craft room. 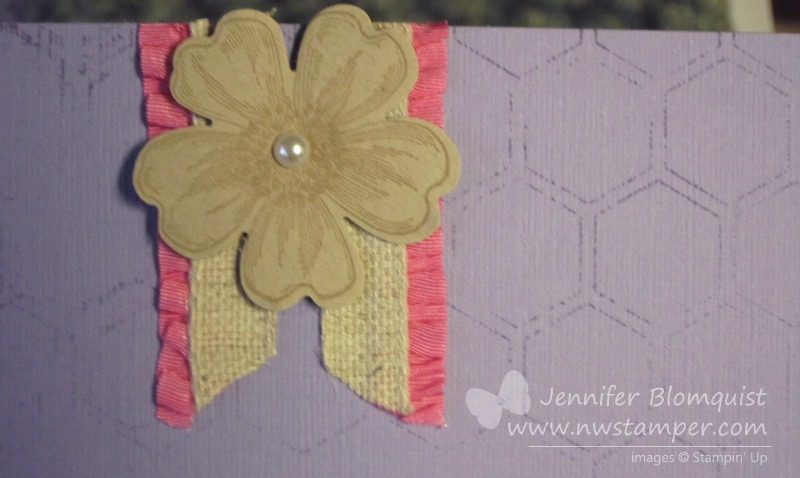 I loved how the new burlap ribbon made a fun border for my scrap of Whisper White cardstock that I stamped with the speckled splatter stamp. So I hope they like it! I really had fun with it and think I may need to make a few more! Don’t forget – the 50% savings for the first 2 months ends August 31st! You can cancel or skip a month anytime with no penalty, so if you’ve been thinking about trying it out, don’t miss out on this great deal! Plus I’ll send you one of these cards as well to thank you for joining. Get your no-obligation Paper Pumpkin subscription started here and use promo code PUMPKINDEAL! Happy Monday! 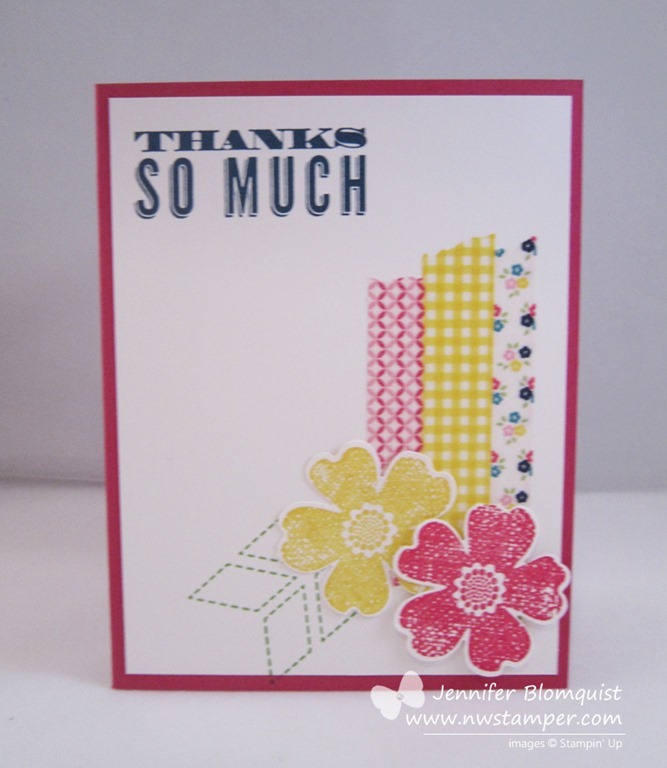 Today over at the Stylin’ Stampin’ INKspiration blog, we are sharing a fun scrapbook sketch idea. I didn’t create the sketch, but let me tell you how much I LOVE designing off of sketches. It makes the scrapbooking process so much easier for me because I don’t have to think too hard about the set-up of the page (or card!) and instead can focus on things like which color do I want to use and what should I write in my journaling. Oh, and did I mention that my layouts are typically like my cards…. I start from a sketch or design, pull in key elements, and then totally change everything else up. But hey! It’s the inspiration that is important – and the fact that I’m actually getting my photos in an album! 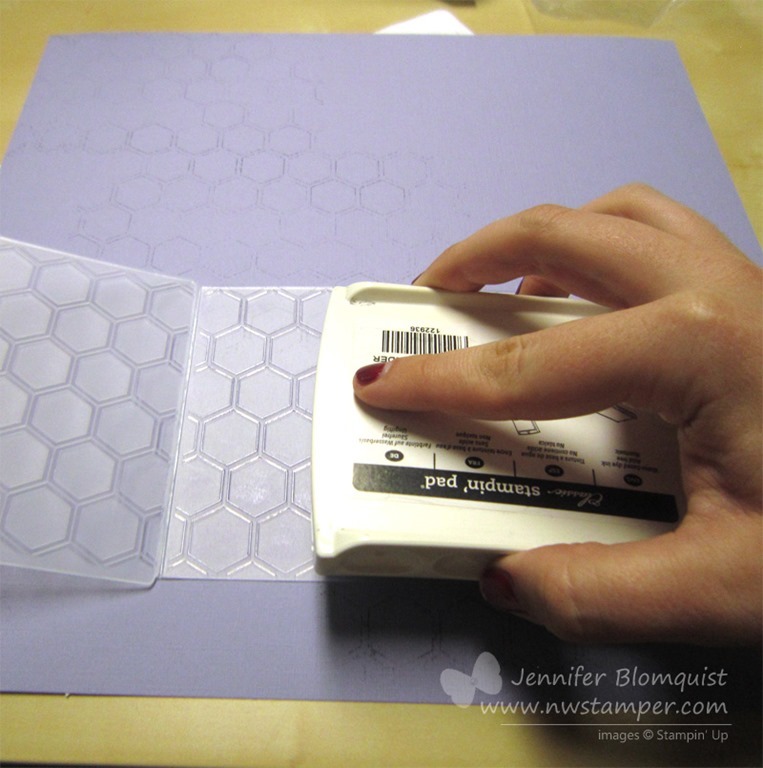 You may be wondering how I got that honeycomb look on my base paper for my scrapbook…. 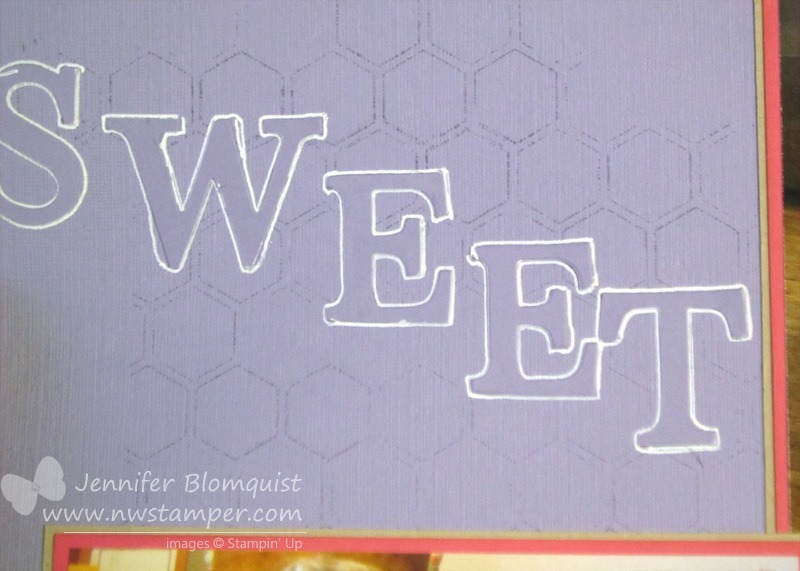 well, check this out… I used my embossing folder as a stamp!!! Seriously, its totally cool! First I wiped my ink pad across the raised side of the embossing folder to ink it up. 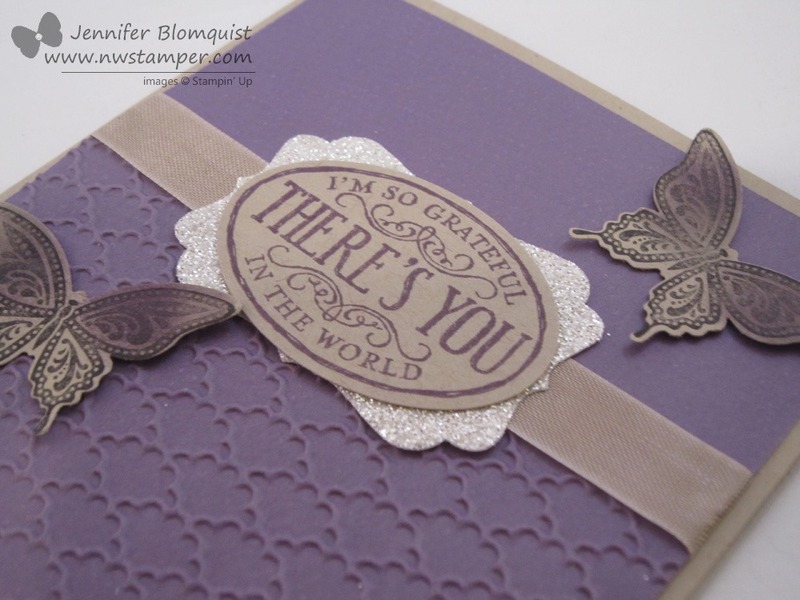 Then I just flipped over the embossing folder and pressed it down like I would a stamp! I liked the distressed (didn’t get all the ink down on the paper) look, so I didn’t worry about evenly pressing and getting it all off on the base paper. Then for my accents, I created my own layered ribbon banners in the upper corner. I took some of the Strawberry Slush Ruffle Trim and the Natural Trim ribbons and layered them. Then snipped the ends at an angle. Then to soften it even more, I use the Flower Shop bundle to get the simple flower to go on top. Finally, I needed a title and ended up actually cutting out my letters using the Typeset Alphabet Bigz dies in the same Wisteria Wonder as the background paper. But that was a little too tone-on-tone and so I drew around the outside of the letters with my white gel pen to make them pop a bit more. I would say that it worked! And look at that face… isn’t Sweet a good title too? Ok, I really didn’t know what to title these too pictures but I loved them so much that I had to scrap them somehow! So, I hope you got some inspiration! Play along and create your own scrapbook page with this sketch and let me know what you think! How to Get Started with Stampin’ Up! for FREE! Have you been thinking about getting the Stampin’ Up! starter kit and getting all the perks of being a demo, but the cost has been keeping you from jumping on the great offers out there? We all know the starter kit is a great deal – picking out $125 in your choice of product for only $99 + FREE shipping; plus with the bonus project kit right now, you get an extra $20-$30 worth of goodies free too! But, if the $99 all at one time is a bit daunting, I wanted to share with you this great math that my fellow demonstrator, Lyssa Zwolanek, came up with that makes it not only FREE to get your starter kit, but you earn extra money too! 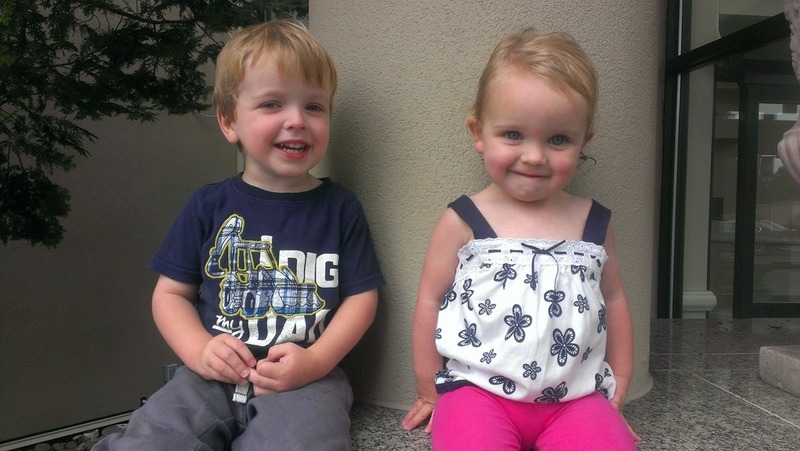 Check out how you can do it too! You host a party with me and all of your friends. Because, no matter what, a night of stamping with friends is awesome! We sign you up as a demonstrator that night and you pick out your $125 in product PLUS the free project kit & accessories; and we put the $99 starter kit on your credit card. You are a demonstrator instantly!! Together we enter the orders for your party with you as the demonstrator. Because your first demo order was over $150 you actually get 30% commission – so you get $120 commission right then! Plus, you are not only the demonstrator but you are also the hostess, so you get the hostess benefits for the party which are at least $65 in free product plus 1 half price item! This order also meets your quarterly minimums, so you are set as an active demonstrator with all the perks until March 2014! That means preordering the newest stuff, discounts on all your orders, earning commission on all orders you place, demonstrator only forums, being a member of my Fun n’ Crafty group with our monthly meetings and Facebook group, and more! You are also almost half way to promoting to Senior Associate and well on your way to earning free stamps as part of Stampin’ Start! That sounds great! Now what? I’m super excited to help everyone take advantage of this fabulous math, and we are going to do it together! So, how it works is that before your party, we will get together (or talk over the phone if we need) and plan what projects you want to show. We’ll talk about what we need to do to make your event a huge success and if you need to borrow stamps or supplies to kick things off – I totally have you covered! At your party, we’ll set up together and you can walk everyone through the projects we’ll be making. I’ll take care of talking through the catalog and specials so you can relax, enjoy, and observe. If any of your friends is interested in hosting their own party and helping you out as you get started as a demo, we’ll put it on your calendar and get you that jump start! Afterwards, I’ll total all the orders up as you relax and hang out with your friends. Then we can together get you signed up as a demonstrator and put in the orders under your name. Woo hoo! But what happens if my party doesn’t hit $400? We still sign you up as a demonstrator that night and enter the party in your name. Any difference in commission you earn vs the starter kit you can just make up and tell your family it is an early Christmas gift to you. You still get all the extra freebies that come along with it, so you are still coming out ahead! Decide you are just going to be the hostess for the evening. 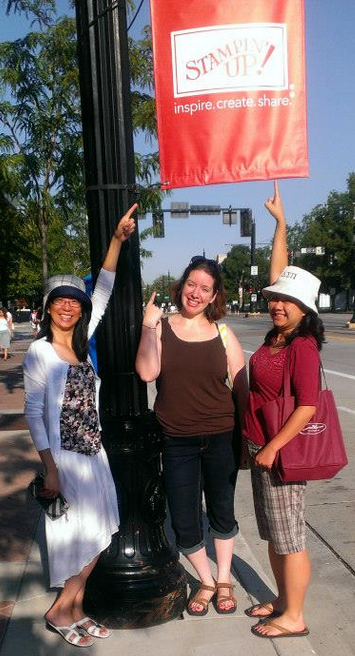 You get all the hostess benefits and you had a fabulous time stamping with your friends. Sweet! You help plan and host a party for you and your friends. – all for $99 plus tax. So, in the end you just got $190 in product and $40 in cash, all in exchange for hosting a fun night of stamping with your friends! Sounds awesome, right? If you want to get started planning your party and join Stampin’ Up! and my team of Fun n’ Crafty demonstrators, give me a call or shoot me an email at jennifer@nwstamper.com and we’ll get you going! I can’t wait to help you get started. Every year that I go to convention, I get caught up in swapping. The idea of taking a bunch of card fronts with you to convention and then trading them with everyone else so that you can get new ideas to take home and share… or copy… or hang on your wall and drool over! Well, I’ve learned from the one year that I showed up with NO SWAPS, and proceeded to spend my first night there trying to make as many swaps as I could from the crafting supplies I happened to bring with me; that I LOVE swapping. I love seeing an amazing card from across the room and running up and saying,”swapping?” Its like the thrill of finding an amazing deal at the department store. But the problem is, I come home with 50-100 card fronts and proceed to take pictures of them and then they sit in a box forgotten until I’m cleaning my room and find them again. So, I decided this year, that I would not only share them on my blog, but I’d also use them for inspiration in my classes as well. (Which really is one of the main points for swapping anyway!) So, for class this month, I CASE’d (copy and share everything) two fabulous swap cards and I just had to share this one with you! 3. The fact that this card uses NO WHITE PAPER at all! I know it is silly, but that last point was kind of profound to me. 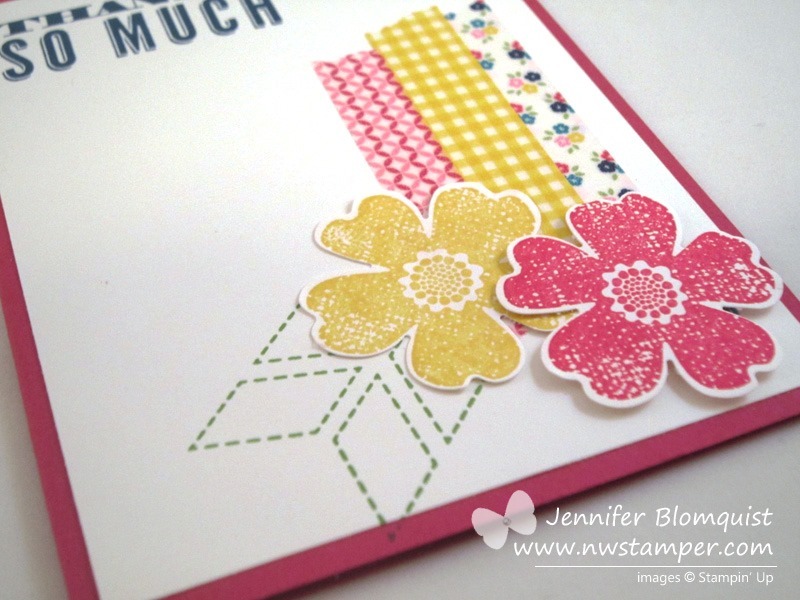 I’m so used to stamping on Whisper White paper with a colored ink that I didn’t think of stamping on Crumb Cake paper. And then there is the really cute butterflies. 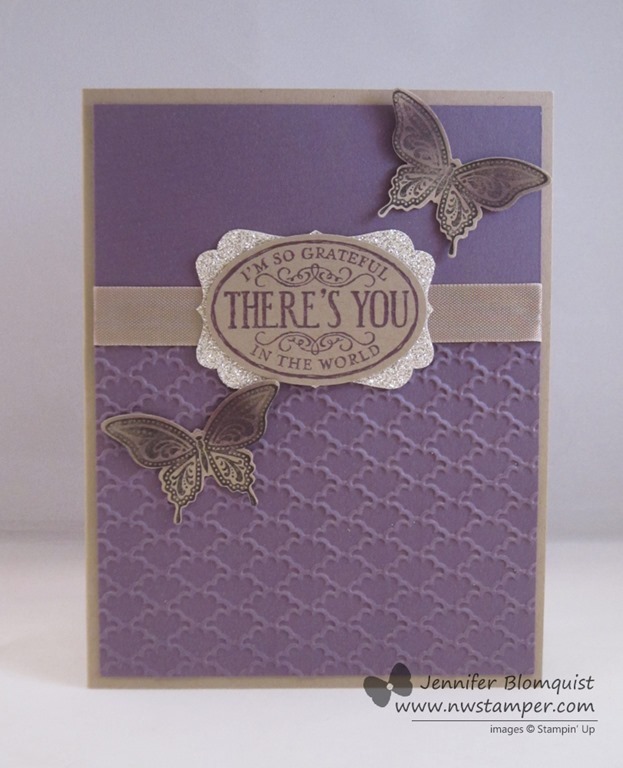 I had to change this up from the original because I didn’t have the Papillion Potpourri that she used, Instead I used the Best of Butterflies stamp set and the Elegant Butterfly punch to make them. They are stamped with Basic Black ink and then sponged on top with the Perfect Plum ink. Neat effect, huh? And in class, I had someone emboss a little bit higher up the page than they meant and so they left their first attempt behind and made a second card. So, I finished out the card with her “boo-boo” and the rest of the supplies only this time I used the Lacy & Lovely stamp set for my sentiment and drew around it with a marker. I think it turned out just fine! So I hope you liked this card as much as I did and I will have another fun card that we case’d tomorrow using the lovely Flower Shop stamp set and punch! See you tomorrow!